Bierebelle has a new brewery to add to the list of favorites.OK, the label might not be terribly glamorous but my goodness they make an amazing IPA. I’m talking about Arbor Ales, yet another exceptional Bristol brewery. I was hooked the moment I tried the Yakima Valley IPA. Looking at the list on Rate Beer, I was dismayed to see how much I’ve missed already. Apart from one of the most extensive back-catalogues of single-hop beers in the history of brewing, they also produce special limited ‘Freestyle Friday’ editions which is just whatever they dreamt up at the Friday meeting. I wish all Friday meetings were like that. 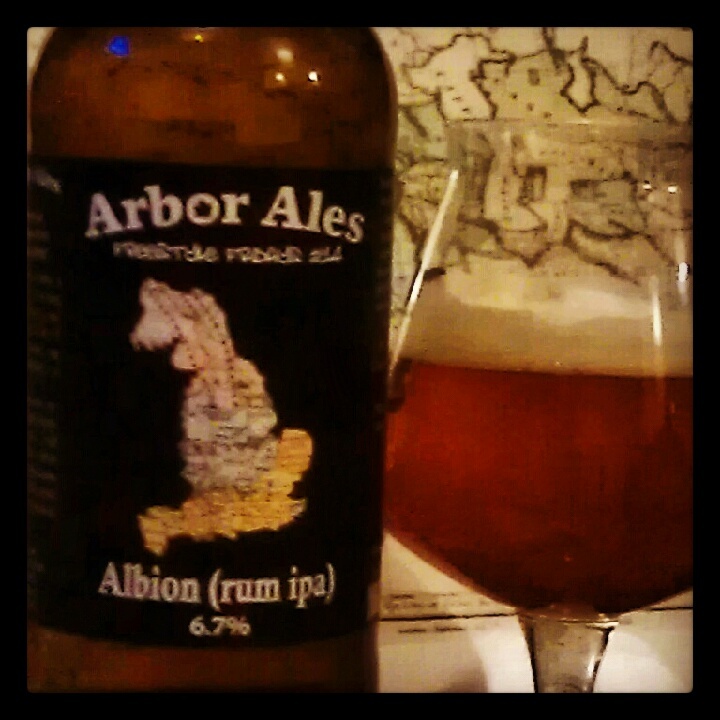 When I saw Albion (6.7%) on the shelf I was intrigued – surely a rum belongs in a darker style right? Wrong. Dark rum + IPA = genius. It pours a really gorgeous cloudy gold with a big, generous head as foamy as the seas. The typical IPA aroma carries just a hint of raisin and biscuit and the flavour is really very bitter and an alcoholic burn at the back. The wave of big, dry citrus hops carries the warming, woody dark fruit of a navy style rum. I’m guessing I wouldn’t have cared much for the rum on its own; I prefer the smooth, light Venezuelan and Panamanian styles but blending a robust navy style with an ipa was a master-stroke.